For the first time EVER, we didn’t have our son’s birthday party at home. He had decided he wanted to invite school friends, and wanted to have it at a place where there were lots of activities. Since we’d never done it before, I wasn’t really sure where to start. So, with a lot of research, I found the perfect birthday party place for him and his friends. Today, I’m going to share the reasons our birthday party place worked. 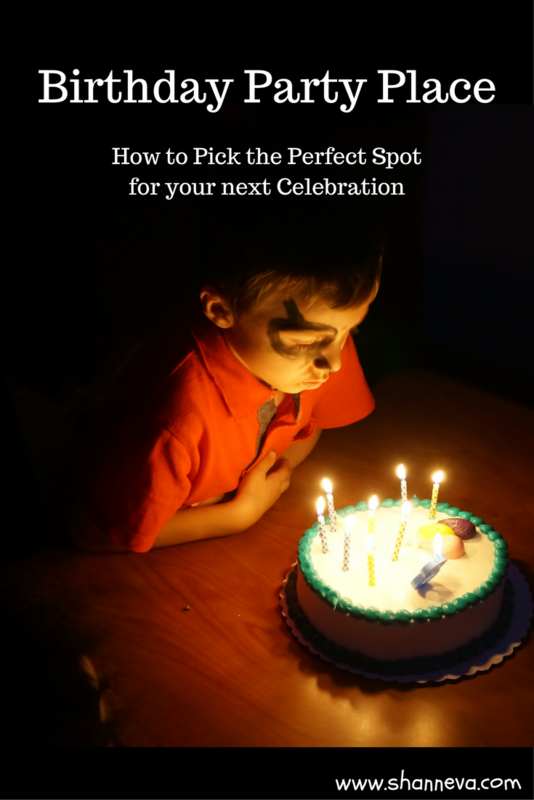 I’m also going to share some things I learned from the experience to help you decide what to do for your next celebration. *I received a discount from Stonefire Pizza Co. in exchange for my honest review. All opinions are my own. Mr. B has been to a few birthday parties at party places, but I’ve never really looked into pricing or anything before. So, my first step was to search the Internet for local places that offer party packages. Some were way out of our price range, some were too anxiety inducing (think too many possible injuries,) and some didn’t have enough activities for the kids. A birthday party location that is within our party budget. We determined this by calculating what we would have spent having the party at home, and adding a little to make up for the lack of clean-up, prep, etc. Enough activities to keep all the kids entertained. While Mr. B was inviting school friends, the twins would also be in attendance, along with a few friends their age. Plus, there would be both girls and boys. Lots of different tastes/ages to think about. Details of the Party Package. We wanted something that included food, a variety of food choices, and also the ability to bring our own cake. Great Customer Service. This one was huge. I wanted a place where the manager was easily accessible, where the staff was friendly, and where everyone felt comfortable. I ended up finding a place that had big kid rides like bumper cars and a ninja course, along with a bouncy house and little kid rides, and games for everyone. Their party package included a buffet, and we could bring our own cake. The manager responded to my email right away, and called me to discuss all the details. She was also very responsive to any questions, and her confidence in her staff made me confident in them to show everyone a good time. When I told Mr. B we would be having his party at StoneFire Pizza Co., he was super excited. He had been their once before with a friend, and had been wanting to go back for a while. He was also excited to invite some school friends. We couldn’t invite his whole class, as there are 24 students, and that was a little over our budget. So, he picked his friends, and I emailed invitations. He was instructed not to talk about the party at school because we didn’t want anyone to feel bad that they weren’t invited. Our Experience at StoneFire Pizza Co. When we arrived, we were introduced to our “Party hosts,” and taken to our private room. Everyone on the invite list just had to tell the front desk whose party they were there for, and would be given a wrist band. They would then be taken to our room. Everyone was super friendly, helpful, and polite. We were off to a great start! We had the room for the first 90 minutes. The Party Hosts said that all the adults were free to go eat at the buffet, and they would entertain the children. For the whole 90 minutes!!!!! That was awesome. I decided to stay because I wanted to check out the entertainment, and most of the other parents did too. It was nice not being responsible for the entertainment, though. 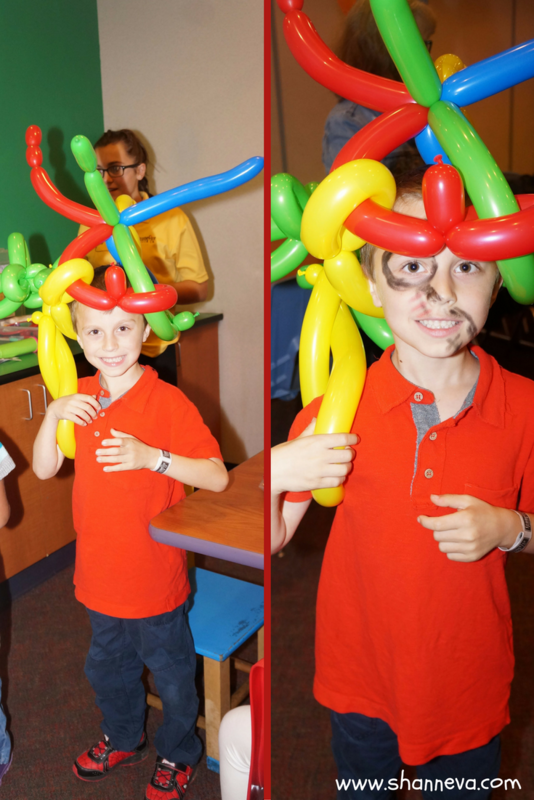 The hosts made balloon animals, did face painting, and played games with the kids. With his pirate hat and palm tree. Pirate Face paint! Arrrgh! They took them all to the buffet, and made sure everyone stayed together. Even though it’s called StoneFire Pizza, there are tons of other options. There is a salad bar, make your own tacos, a baked potato bar, chicken nuggets, fries, and mac and cheese. There are also dessert options, including cookies, soft serve ice cream, and slushies. Plus, you can get soda, water, or juice. After eating, they each decorated a pumpkin, got some cotton candy, and watched a magic trick. 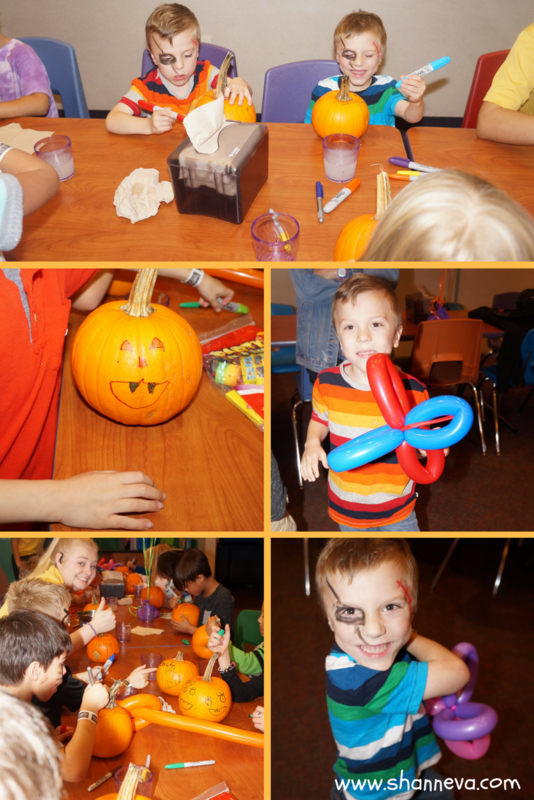 Decorating pumpkins and balloon butterflies. What could be better? Mr. B also got to go into a booth and grab for tickets. 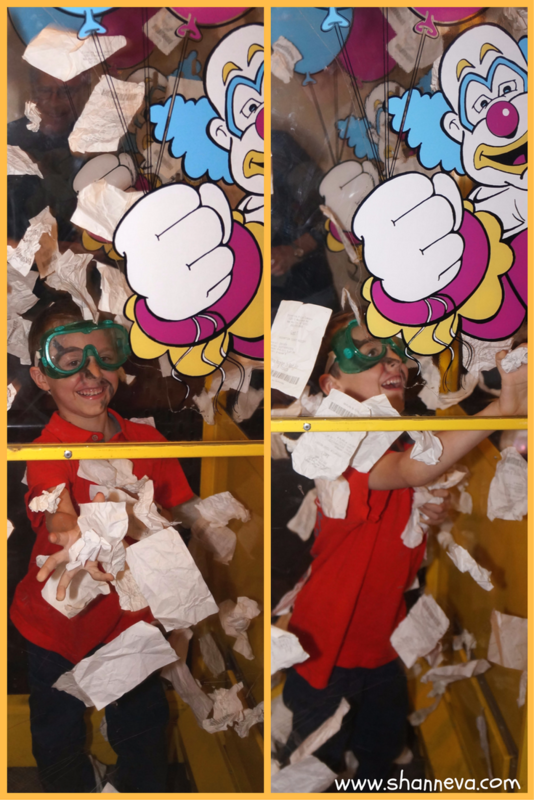 The tickets could be redeemed in their prize center, and the other children had chances to win them during the rest of the party. Mr. B did a pretty good job, but the hostess also helped him out, which was awesome. Then, it was time for cake. It was perfect timing because just as the sugar kicked in, it was time to go and play in the other room. 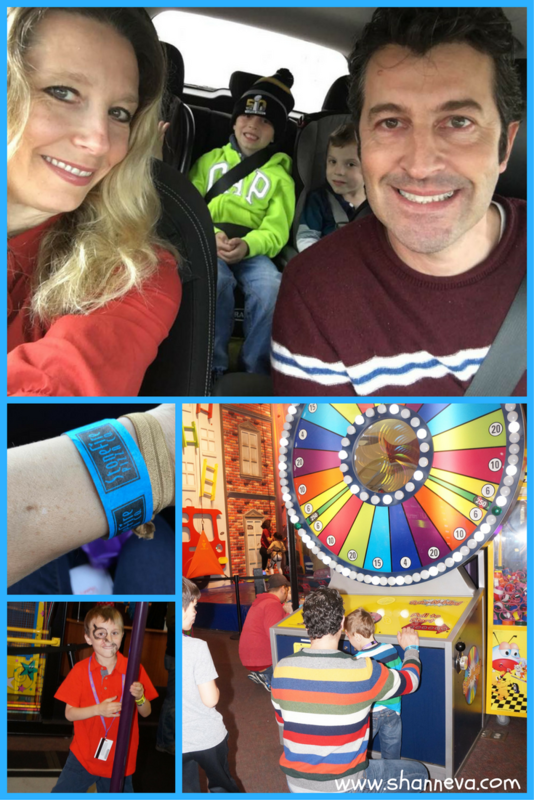 Each child got a $20 game card to play ticketed games, an hour to play non-ticketed games, like air hockey, and unlimited time to play on the bumper cars, bounce house, rock wall, and frog ride. Plus, they each got to run through the Ninja Warrior Course. I’m just tired thinking about it all again. There was really rides and games for every age. 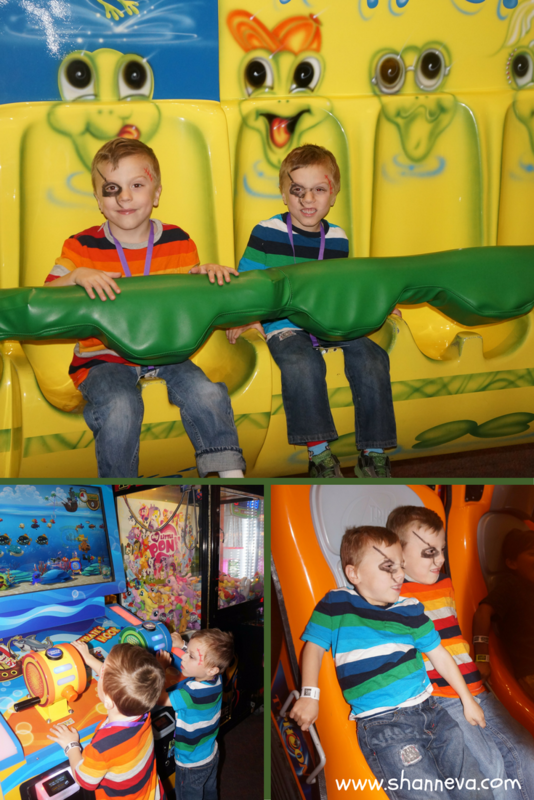 The twins enjoyed the frog ride, and played a lot of the games with bright colors and spinning wheels. Mr. B and his friends loved the bumper cars, but the Ninja course was a close second. Ninja Warrior, bumper cars, and bouncy house fun. Mr. B also loved playing the grabber game, and even won a big, shiny ball. Once the kids had used up all the money on their card, they could go and redeem what ever tickets they earned (which automatically go back on the card,) in the prize room. It was then time to round everyone up, grab their stuff, and find their parents. The party hosts had taken all of our stuff to a locked room, and I gave them my ticket to get all of our jackets and the decorated pumpkins. In addition to taking their pumpkin home and their prizes, each child received a goody bag. We made sure everyone was accounted for and left safely. Then, our family, along with our friends that had helped watch the kids, headed back to the buffet for some ice cream, cookies, and slushies. We found another room for the kids to play in, with slides and climbing walls. We seriously had to drag them out to go home because us parents were tired! It was so nice to not have to worry about cleaning the house, and then trying to remember where I shoved everything, since that’s my normal cleaning method. I saved tons of time with the lack of preparation needed. I do enjoy shopping and crafting with my birthday party themes, but I really spend a LOT of time on it. With school, work, and life, this really was nice. Plus, I didn’t have to stress out about the weather. Our house is not huge, so we usually have parties outdoors. October is a really crazy month for weather in Wisconsin. The day of the party was rainy and cold, so woo hoo for an indoor space! Since it was a public space, the only thing that was stressful for me was keeping track of the kids in a public space. During the first 90 minutes, they were in a confined space of the party room, but for the last 90 minutes, they had the run of the place. The place was secure, with guest services being right at the front, and gates to go through, but I’m a worrier mom. The manager suggested at least 4 to 6 adults, with the 13 kids we were having. We ended up with 6 adults, plus me and my husband, but it was still hard to keep track of every single kid at every single moment once they were out of our private party room. We all took turns doing laps around the games and activities, making sure we had an eye on everyone. If the party would have been for the twins, I would have had all the parents stay. Since they were mostly 8-year-olds, I think the number of adults was fine. Celebrate the birthday kid by wearing his favorite color! If you have money in your budget, buy some cheap, bright shirts at a place like Michael’s or Hobby Lobby. If you’re crafty, you could even put a birthday message on them, and give them as favors. Or, if you don’t want to buy something, tell everyone to wear the birthday kid’s favorite color. That way, the kids are a little easier to spot. To Party at Home or Birthday Party Place? Overall, we had an awesome first time experience with our birthday party place. StoneFire Pizza Co. was a great value, with a private room, a buffet, and tons of entertainment. All the kids had a lot of fun, especially the birthday boy. 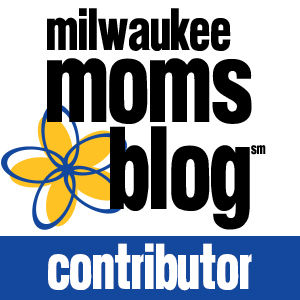 If you’re in the Milwaukee/Waukesha area, you can check out all their different party packages HERE. Not only can you have a birthday party, but they have private rooms and a sports bar for the adults. If you mention Shann Eva’s Blog, you can get a 10% discount on your party! Now, the twins want their birthday party there too! So, how do you celebrate birthdays? We’ve never done a party place but you’re making me want to. The no clean up is very very tempting! Looks like you all had a fab time! Yes! Definitely a great bonus! Thank you! Great post. Your son looked like he had a great party, and what a great review for stonefire pizza co! If they had one where I live, I’d defiantly be having my sons party there! Such a perfect place for celebrating birthdays! It looks so much fun! I bet everyone had a blast! They really did! Thank you! Looks like you had fun! We usually do birthday parties either at our house or in the fellowship hall of our church, depending on how many guests are coming. Now that they are getting older we might start branching out a little in the future. Yes! Since it was his first year with school friends, we thought it was the perfect time to try. Thank you! It looks like the kids had an awesome time! What a fun party! They did! Thank you Monica! That sounds like a great place to have a birthday party! The Ninja Warrior obstacle course must have been a blast for them, actually, everything sounds perfect. So, here in the suburbs of Washington DC (some very wealthy, snobby areas), the trend is to throw your child birthday parties that cost almost as much as weddings and they are ridiculous. I’m so glad that you point out how important it is to choose options that fit in your budget. It makes so much sense and the kids look like they had a blast. Thanks for sharing! When I was younger, I mostly had birthdays at home but I did have it a bowling alley once and that was fun! I think both have a lot of merits. This place sounds AWESOME. I love that it was a buffet so kids had their pick of what they wanted. And your idea of wearing the same colored shirt is a good one! I had parties at home as a kid too, which is why I think I was reluctant to try this. But, it really worked out great! Thank you so much for stopping by! Sounds like a great place for a party! By the looks on the kids’ faces, I think it was a huge success! Ha ha! Yes, I was very happy to have lots of help! That looks like an awesome party! 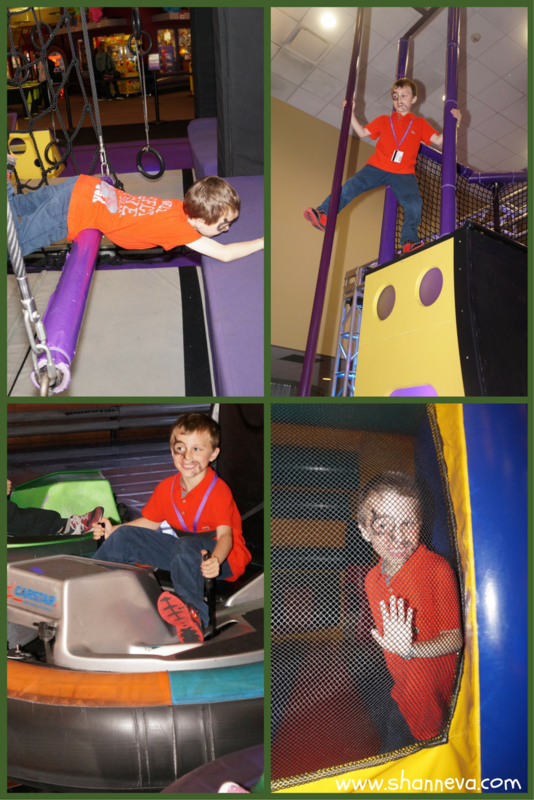 Grab booths are my kids favorites and it looks like he had a blast in there too! Great post! Thank you so much Meaghan! What a great place to host a party! It looks like you all had so much fun! Looks like a fun party! Customer service is so important when finding a place – I was looking for somewhere to host a party and the owner stopped responding to my emails for awhile, that definitely seemed like a warning sign to me. wonderful tips. Having the right place is so important. If its not a good fit the whole day can become stressful. Been there done that. This looks so fun! I am currently having the what-type-of-party debate myself. This looks like so much fun! Thanks for the tips – we are just starting to plan my son’s third birthday. It will be the first one where we invite the class. Can’t wait! Looks like a fantastic party. I think just because you are trying so hard to make the day special for your little ones is all that matters. They are so lucky to have a caring mom, loving mom that tries hard to create special memories. The party looked like blast!! Memories in the making! What a fun party! StoneFire Pizza Co.did a great job and the best part for parents is no mess to clean up afterwards!